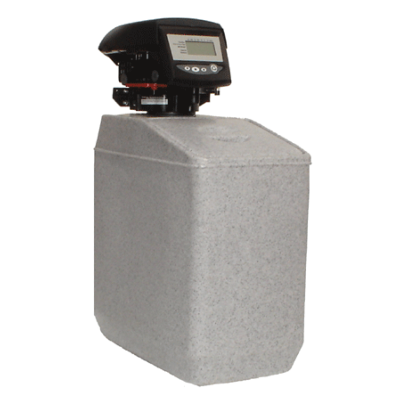 The more basic water softeners operate on a timed basis. The time clock is set to carry out its regeneration on set days. This is usually calculated by the hardness of your water supply, the capacity of the water softener and number of people in the property. When installed, the softener is set to regenerate at usually 2.00a.m. at the calculated regeneration frequency. To ensure that soft water is always available, the interval between regenerations will be under estimated rather than over estimated. The softener will then regenerate at this set interval regardless of the volume of water used. If the water usage is low, for instance, one or more of the residence is away, there will be unused softened water capacity at the time of regeneration, which can be argued as an unnecessary waste of salt and regeneration water. Similarly, if there is an increase in your water usage, the softened water capacity will me than likely be exceeded and the water would go hard towards the end of the cycle before the next regeneration. If you are going to be away from the property for a period of time, i.e. on holiday, and there will be no water flowing through the water softener it is advisable that it is switched off until your return. Free Delivery on all softeners! Suitable for households up to 5 people and uses tablet salt. The Coral Time Clock softener for up to 4 people. This unit is designed for use in commercial applications where hot water needs to be softened. 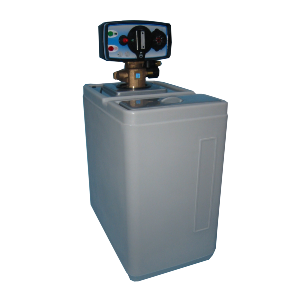 10-litre Hot Water Softener - ideal for commercial dishwashers and washing machines with a hot water feed. Designed to operate to a maximum of 65°C.